​Please join us on Saturday, May 4th at 2:00 p.m. for a formal dedication of the home for Danielle Beckett and her family. Thanks to 122 different people who contributed 3,630 hours of work on the house, the home is now ready for Danielle and her family to move in. There will be a brief ceremony and light refreshments will be served. It is a time for our volunteers to come together to celebrate with Danielle and her family the completion of their home. This spring we will build a storage shed and will complete the landscaping. ​Click to see photos of the interior of the home. Danielle Beckett and her children are very excited about their new home! "My kids and I are so very excited to be able to finally have a place to call our own, and I couldn’t be happier to be presented with this opportunity! Thank you so much." ​Read December 29, 2018 article in the Rutland Herald. Interested in owning a Habitat home or know someone who would like to learn about the possibility? 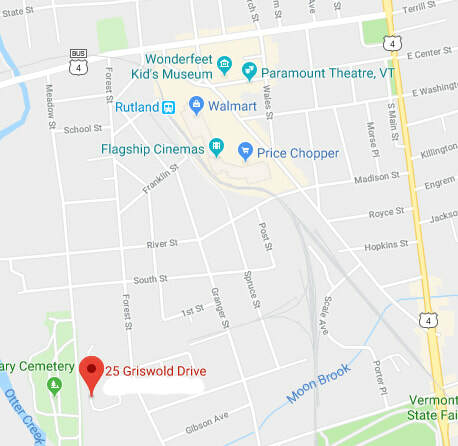 Click on this link to learn about applying for a home that we will build in 2019 on 120 Crescent Street in Rutland City. ​Interview with former President, Jimmy Carter on the case for affordable housing. ​2018 - Fall Print Newsletter - Everyone on our mailing list should have received our fall print newsletter in the mail. If you didn't receive one, please email us to make sure we have your correct snail mail address for future mailings. We will be pleased to mail you a copy. Click to download the issue. The Mission: ​Habitat for Humanity is a global non-profit organization dedicated to eradicate poverty by providing families in need with safe and affordable housing solutions. Habitat for Humanity’s vision is a world where everyone has a decent place to live. Habitat’s work is anchored on the conviction that safe and affordable housing provides a critical foundation for breaking the cycle of poverty. ​Click to e-mail - it is the fastest way to contact us. Photo above: what the house, designed by John Berryhill, will look like when it is completed. Transforming people's lives and our community by creating safe, affordable and sufficient housing, lifting up one household at a time. There are many ways, large and small, that people can make a difference. You do NOT need to be skilled as a carpenter. 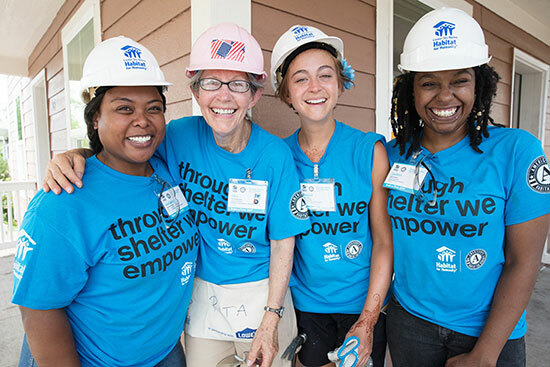 Think of Habitat as a small business that is entirely run by volunteers. We estimate that half of the hours contributed by volunteers are completed by people who never pound a single nail. If you admire Habitat's mission and want to have an impact locally, please contact us. Donate to help us unlock futures. Our work has demonstrated time and again that Home is the Key. Your support helps us create strength, stability and self-reliance through shelter, which plays a key role in positively influencing a family’s education, health and financial stability. HFHI - Annual Report - In fiscal year 2018, Habitat for Humanity helped more than 8.7 million people worldwide improve their living conditions through new home construction, rehabilitation, incremental improvements, repairs or improved market access to affordable housing. View the annual report online here, and read Habitat for Humanity International’s press release here. Consider donating your used car to Habitat. HfHI will handle all the details. If you designate that you want the proceeds to come to our affiliate, the value of your gift will make a difference locally. Through housing we help our home buyers to gain greater strength, stability, and independence. HFHI asked Habitat supporters for their favorite home maintenance and improvement tips — and they responded by the thousands! HFHI experts reviewed and selected the best. The result is a collection of more than 150 DIY tips to care for your home inside and out — and on a budget. Download your free guide today! It's Murphy's Law: If you're wearing a brand-new shirt, you spill something on it. Or, you've just cleaned the house and your puppy decides to track mud across the carpet. What are some non-toxic quick fixes for life's large and small stains? The Solid Waste Alliance has compiled a tremendous list of some effective methods that use what you may already have around the house. ​ The goal is to use non-toxic materials and to have things look as good as new!. Click to download the article. Our office is located in Suite 4, the lower level of the City Center - 67 Merchants Row in Rutland.